We are all deplorables now. There is no distinction between non-deplorables and deplorables. The progressive reality is that the “deplorables” vote Republican and the “non-deplorables” vote Democrat. But the reality is that the Democrat voters are deplorable in the eyes of the Democrats, that is why the progressive cabal continues to pander to them. For instance inner cities like St Louis and Chicago are a melting pot of Deplorables. Any blind person can see that. It’s deplorable that Trump has built his campaign largely on prejudice and paranoia and given a national platform to hateful views and voices, including by retweeting fringe bigots with a few dozen followers and spreading their message to 11 million people,” Clinton said. But its not deplorable to call 50% of Americans deplorable according the lying Clinton. In fact the most deplorable thing today is the inner city, their school system, their gang problem and the Democrat politicians who run these cities of violence and crime. The lady is a fabrication, a joke, a liar, a killer, but most of all the American people know she should be in Jail. When you have to reply to your bigoted bias statement, America knows how you truly think. 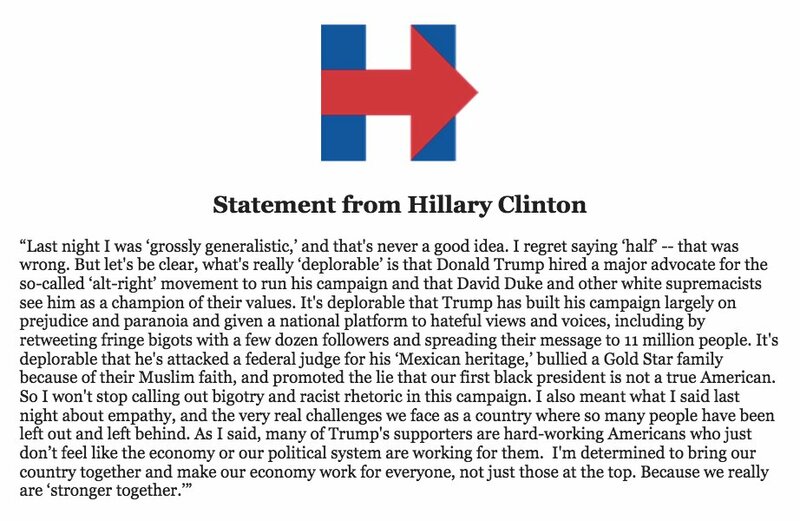 This was not an off the cuff remark, this a prewritten campaign speech. “Really strong together”, B.S. When the likes of the progressives have divided the nation and then they say we are stronger together? It seems as if it’s at least once a week over the past seven years that one conservative columnist or another, and often several, lists the crimes and blundering of Obama and his administration. Everything these radicals have done has served to undermine the Constitution, the Rule of Law, our traditional culture, Christianity, our economy, our sovereignty, and our national security. Had they been white conservatives, any one of these actions would have gotten them, a) impeached; b) investigated by a Special Prosecutor; c) indicted; or, at the least, d) driven to resign. But since We, the People no longer have any real representation in Washington, none of this has occurred. Our government has been taken over in a silent coup by radical Marxists, neo-fascists, and self-serving con men, posing as elected representatives from both parties. Over and over and over and over, the ruling “elite” has ignored the fact that 60 to 90% of the American people have opposed the laws and policies that they have gone ahead and shoved down our throats, anyway. These have been discussed in excruciating detail time and again in the past, so I will not repeat what you should already know. Indeed, it is his policies in the Middle East that have created ISIL/ISIS and allowed dozens of other Islamic jihadist organizations to arise and/or expand exponentially. And though after years of attacks, he still refuses to admit that nearly all the acts of terrorism worldwide are by Mulsim zealots (https://www.facebook.com/AussieLanguage/videos/vb.213358308795914/671460799652327/?type=2&theater). The “mainstream” media, in blatant collusion with him, also refuses to call it Islamic terrorism, and is complicit in aiding him in covering it up at home (http://www.dcclothesline.com/2015/11/22/a-list-of-islamic-terror-attacks-planned-andor-accomplished-in-the-us-that-hussein-obama-has-covered-up/). Many in America are convinced that Obama is a closet Muslim and his actions over that past eight years have done nothing to disabuse us of this notion (https://www.facebook.com/Gallagher.Mike/posts/10150459723149943). In fact, as we speak, Obama is touring Asia, bad-mouthing America in Muslim countries as he has done before, trying to make it look like those who resist his pro-Islamic jihadist policies are an ignorant, bigoted minority. In addition, his attempt to force 100,000 Muslims into American communities – mostly in Republican areas – is clearly – repeat: CLEARLY! – an attack on our freedom unprecedented (there’s that word again that the “mainstream” media love to apply to his actions) in the entire history of OUR country. The time has come for We, the People, who make up the clear majority of the citizens of America, to stand up and demand that Barack Hussein Obama resign from office, immediately. It’s obvious that no one in Congress will live up to their sworn Oath of Office to do their mandated duty and impeach him. Thus, it is up to us, the ones suffering most under his oppressive, dangerous, destructive, and totally unconstitutional and un-American policies, to take back the power we mistakenly delegated to the cabal occupying our capitol and the White House. This, of course, is not to say that if any of the Republican candidates want to support us in the demand for Obama’s immediate resignation that they would not be welcome. But this needs to be ours. We don’t need another self-proclaimed “leader” to make this happen. America is OUR country. We, the People are the owners, and it’s time we acted like it. With Obama leading the band on politically correctness Christians have no chance in dictating the message. Do not be mistaken by the lies coming from the liberal progressive cabal. Those lies infer that the country was not born on the Judeo-Christian ethich, but were free of a state sponsored religion. Truth be told, the country was born on a strict moral code reflecting the biblical truths that orthodox Christians hold dear; this includes those of the Jewish faith. Don’t be misled by today’s Romans. Notice the word “respecting” which according to the Merriam-Webster dictionary means “considering“. In (click here for more details) Everson v. Board of Education (1947), the Court drew on Founding Father Thomas Jefferson‘s correspondence to call for “a wall of separation between church and State”, though the precise boundary of this separation remains in dispute. Let there be no mistake about it the Founding Fathers adhered to the Christian faith in some way or another, they believed in the Ten Commandments, but most of all were men of morals. Washington took his oath of office with an altar bible borrowed from the St. John’s Lodge No. 1, Ancient York Masons lodge in New York and he kissed the Bible after taking the oath of office. Subsequent presidents followed suit, up to and including Harry Truman, but Dwight D. Eisenhower broke that tradition by saying his own prayer instead of kissing the Bible. As time progressed many citizens were offended by symbols of Christianity, suits were brought, regulations changed and symbols removed. Additionally, courts have ruled that any form, be it words, statutes or verse be removed from public property. These courts have desecrated the foundation of the United States and the principles which it stands for. We are concerned that the majority of today’s Christians are pacified. They have rolled over without a fight, watching the principles they stand for tarnished to no end. We are not saying that Christian should be promoted by government, but we are saying is that the principles of Christianity should be the guiding light going forward without government interference. We might ask why are the Ten Commandments place so often on court houses, schools, public places if it were not for instilling a strict moral code on its citizens? Our country is at war, one that we are losing. Unless the Judeo-Christian ethic is once again vigorously promoted the United States, the moral leader of the free world, will lose, if it has not already done so, its preeminent status in the world. One salient point, sending children to parochial schools saves the taxpayer $10,000 at a minimum per child and people had the audacity to question the subsidy for school bus transportation. What nerve.